EPBOT: The Best Quotable Movies - As Picked By You! Disney statisticians actually say that Emperor's New Groove is their MOST QUOTED movie of all time. 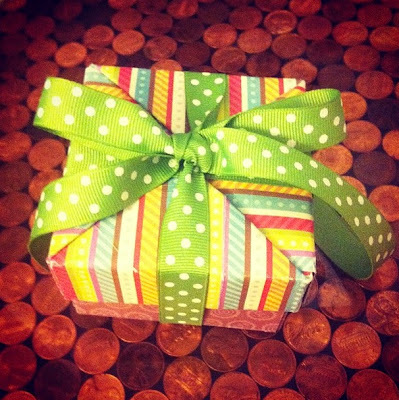 You do gift-wrap as beautifully as you do everything else! It's getting to be a lost art, what with the ease and convenience of gift bags and tissue paper. Jen, I am completely and thoroughly bummed that I will not get to be your secret Wonder Twin Bracelet wearer. However, I am inspired to make my own cuff. I know exactly what I'm doing this weekend! Cross your fingers that I find something good. If you want to pick up a copy of The Avengers (and really, why wouldn't you? ), get thee to a Target. They have the 4 disc combo pack with Blu-ray 3D, Blu-ray, DVD, Digital copy, and Digital music PLUS an exclusive Blu-ray bonus disc with 90mins of footage! The best part.... Only $19.99 right now! SCORE! I missed the facebook movie-love-athon, but may I humbly recommend Oh Brother Where Art Thou? Talk about a quotable movie! Also, my 15 year old just admitted that he hasn't seen all of The Princess Bride because he gets half way through and then falls asleep. :( Where have I gone wrong? The most quoted movie in our house is definitely Joe vs. the Volcano. ("I know he can get the job, but can he do the job? ", "I'm going now." etc, etc...) I've often wondered if there are any other CW/EPBOT fans who love this movie. Anyone else? "I'm not arguing that with you, Harry." Love Joe vs. the volcano! Oh, Young Frankenstein has to be on your list. If you haven't seen it, see it. If you have, see it again. You HAVE to watch Avengers. Joss Whedon did an amazing job with it. My copy just came in the mail from Amazon today! After thinking about it I reaalize I quote movies a lot. My sister and I have a tendency to speak in Wizard of Oz/Twister quotes and at Christmas we will quote White Christmas all day long. I love the most quoted list. I was just telling my boyfriend we need to watch Willow! I'm so behind on my movie watching! I haven't seen Mega Mind or The Fifth Element! I saw the Willow quote and immediately wanted to see that one again. I LOVED that movie. 2 days ago I was mindlessly watching Ripley's on TNT and they showed a guy born with 12 fingers. I started giggling incessantly and the hubby asked me why. I looked at him and went "You have six fingers on your right hand, someone was looking for you". I can quote Emperor's new groove like crazy. It is insanely underrated and I want it to be very well known. My mom and I can go on 10 minute quoting sessions and we sing the birthday song to each other every year. Also, my roommate and I quote "my spinach puffs" almost every time we cook. So glad to see it getting the appreciation it so deserves. Aww man! I tried to comment mine in the other post, but an "error" occured while sending. Have you seen Little Shop of Horrors? I was so glad to see all the others who love Better Off Dead. So many people I know have never seen it and look at me like I'm crazy when I mention or quote it. 900 comment and you compiled a list and moderated them all?? You ARE Wonder Woman! Emperor's New Groove FTW. It's my favorite Disney movie, hands down. I constantly yell in traffic "you threw off my groove!" Now *I* have a list of movies to watch. I'll have to see if I can get my hands on some of them. What was the winning quote? You mean the most used Firefly quote isn't-You are damaging my calm? That gets used almost daily around here. Along with Shiny! Anywho, Princess Bride IS probably the most-quoted movie in our house, for sure! Along with Star Wars, Holy Grail, Young Frankenstein...we kind of converse in movie quotes. It's a fabulous illness! The thing that has stuck with me from Lilo and Stitch is the soundtrack. There is just something fantastic about rocking out to Elvis and happy Hawaiian children while driving down the highway. I totally wanted to be your bestie, but I can barely narrow down a list of top movies let alone a single quote. I tried, I really did. I do love so many of the top quoted movies too. I mean, my son is of course named after the dread pirate (the one nobody would fear). I thought I was the only person who hadn't seen the Avengers yet. I haven't actually seen Emperor's New Groove either. I'll have to add it to my list of movies to watch! Zoomom, you're not alone with the Joe love! But Better Off Dead is my all time fave, and the one that sparked my long love affair with John Cusack. I too missed the original post. But my favorite quote..."I carried a watermelon". Because, what? Dirty Dancing, always a classic. What, no Office Space?? Um, yeah. I'm gonna need you to get on that. Okay? Yeah. i didn't join in to the game because, while i think the cuff looks fabulous, i know i wouldn't really wear it, so i decided to leave it to someone who would. A philosopher once asked, "Are we human because we gaze at the stars, or do we gaze at them because we are human?" Pointless, really... "Do the stars gaze back?" Now *that's* a question. Great deal of good it did you, killing me, Secundus. Because now, of course, you're King of all Stormhold. Oh sorry, wait, no you're not - you're dead! both quotes are from Stardust, which is one of my all time favourite fairy tales, and i think that might be because it's a very good movie adaption from a book by my very favourite author (Neil Gaiman). Seriously, if you like The Princess Bride you'll love this one! And yes, you NEED to see The Avengers! One movie I'm fairly sure you'd like is called "Radioland Murders". It's a bit in the same vein as "Clue", but is set in the 1940s during a live Radio production. Very fast paced and lots of great lines! It's really sad that so few people know about it! I think Emperor's New Groove might have been too adult for kids. It's probably my favorite "newish" Disney movie. And me and my husband speak in squirrel all the time too. In fact, we don't even use the word "squirrel" anymore, now we call them Squeakers. Yo, Zoomom! "Joe Versus the Volcano" is a beloved, often-quoted standard in our house, screened at least a couple times a year. "I know he can get the job, but can he DO the job?" Sorry I didn't get in on this earlier but Rose in The African Queen has always been my favorite movie character and says my favorite movie line: "I never dreamed that any mere physical experience could be so stimulating!" Such a good line in so many ways. BWAHAhahahaha!! However, said niece and her sister do a MEAN reenactment of the " a llama! " scene in the laboratory with Kronk and Yzma. oh...did i mention she is now 6 ft and wants to go as R2D2 for a costume party? "Wuv, twu wuv, is what bwings us togevver, today." Completely agree with you on Emperor's New Groove. We also do the "squeaker squeak squeak?" in our house. My roommates and I would say "it's possible, PIG" and respond "that's why I'm still alive!" HI, Zoomom! My husband and I thought we were the only two people in the world who had even SEEN "Joe vs the Volcano." We did love that movie . . . need to see it again. Surprised that no one mentioned "Groundhog Day" as most quoted: "What if there IS no tomorrow? There wasn't one today! . . . Hello?" Sooo many good quotes from that movie, too. I really want to just hang out and talk about movies with all you fine folks! Such awesome taste! I am tickled beyond measure that there are a few fellow Joe fans out there, too. RevAnne, I love John Cusack too; it was One Crazy Summer that I first saw him. How can you not have seen Avengers yet? It's been on DVD since Tuesday! On another note, if you want to come up to Boston, smore's pie and the Avengers will be happening tonight. :P Because Joss Whedon's genius must be spread to as many people as possible. "It's just a flesh wound.."
Also, thanks, Kathryn D., now I know where to get a copy of Avengers! I need to go back and read the rest of the quotes. There were only about half as many when I read it last. Ahhh - what a great list of ones to re-watch! I was so very proud of my boys a couple of years ago (age 10 and 12 at the time) won the local eisteddfod duologue section with performance of The Princess Bride - Sicilian vs Roberts scene. Oh - my husband frequently speaks squirrel-ese! September 8th was my husband and me's, 5 year wedding anniversary, so natuarally we went to a amusement park. and everytime we would gone on a roller coaster he would yell at me "Put your arms up Yzma!" i couldn't help but laugh every time!. I swear, you guys have all been eavesdropping on me and my hubby/gaming group! I agree with lis; Stardust is an amazing book & movie. Gaiman is brilliant and that movie was so underrated. We rented it from Netflix and proceeded to buy it on Blu-Ray because it was so good. We each quote differently in my house. I mostly quote anything Joss Whedon (Buffy, Angel, Firefly, Dr. Horrible, Serenity, Avengers.) My husband is old school (Ghost Busters, Superman, Star Wars), my teen quotes Scott Pilgrim all the time ("That's actually hilarious" or "Chicken isn't vegan?" when we eat chicken) and the under 10 gal is usually quoting Adventure Time. This list is missing Groundhog Day, which rivals The Princess Bride for quotes around here. And Hulk? Smash. We say that all the time now. Also, call it cap. Clue!!! Clue has the best quotable lines EVER! Considering how much David Spade truly annoys me, Emperor's New Groove is surprisingly great. Might I also suggest Mystery Science Theater 3000 The Movie and Brave Little Toaster? Thank you for the love of Emperor's New Groove. My husband & I can't see a llama without yelling "llama face!" I'm surprised Pirates of the Caribbean didn't make the list; it's one of the most quotable movies I've ever seen, right after The Princess Bride. "You seem somewhat familiar; have I threatened you before?" "Stop blowing holes in my ship!" Emporer's New Groove: "Someone's throwin' things"
When my baby girl was young "Willow" was released. To this day - she's 28 now - her brothers still call her 'Peck' and to this day she still hates it. "Riiiiiiiiiiiight". I wish I could have that as an audio clip to play whenever I hear something that needs it. It's like George Takei's "Ohhhhh Myyyyy". Oh my, a list that includes Galaxy Quest, right up top! "Is there AIR??? You don't know!!!" "Can you form some kind of rudimentary lathe?!"